Welcome, online booking on club website. Stavanger – joint European City of Culture with Liverpool in 2008 – is best known as a former sardine fishing port turned North Sea oil production hub. It’s home to over 100,000 inhabitants, a good proportion of whom pursue their golfing activities on the nearby courses from April to November every year. The 6,281-yard, par 71 course at Stavanger Golf Club lies close to the town centre and was designed by British architect Fred Smith who routed the eighteen holes over undulating land beside Store Stokkavann, a freshwater lake surrounded by forests. Unsurprisingly then, Stavanger Golf Club’s holes are tree-lined and relatively tight so precision off the tee are the watchwords here. The round opens with a couple of gentle par fours before one of the best holes on the card is played. The 180-yard, par three, 3rd runs beside Store Stokkavann and the tee shot must be played from an elevated position across an inlet from the lake that runs in front of the green. On the back nine, there is a very strong run of par fours sandwiched between the par threes at the 10th and 17th holes before the 508-yard, par five, 18th hole concludes the round. A narrow, left doglegged hole, it demands accuracy all the way from tee to green otherwise the encroaching tree line will put paid to any chance of a finishing five on the card. The club is keen to redevelop Stavanger on an ongoing basis and Niblick Golf Design reconstructed both the greens on the 1st and the 10th in 2006 as part of a refurbishment program. In 2009, the same company replaced all the other greens, installed new drainage and rebunkered many of the holes. The main golf course in Stavanger, set next to a suburban lake about 10 minutes from the centre of the city. It's a parkland members course that seemed generally busy and the fairways and greens showed plenty of wear but without unduly affecting the condition of the course. Plenty of trees lining every hole and very green, with enough hazards and changes in direction of the fairways to make the course interesting. I haven't played any other courses in Norway, so can't compare this against other courses there, but comparing it to other courses in Continental Europe and the British Isles, I'd say this is a solid course without being spectacular. There are some fine courses in the Stavanger area, but Stavanger is undoubtedly the finest. The location is quite special, beside lake Stokkavann and close to the city centre, but still quiet and tranquil. Walking the fairways lined with pine and fir and watching the squirrels go about with their daily chores should calm even the most highly strung player. The course itself is a fine challenge for the precise hitter, not particularly long but quite demanding in terms of placement, on many of the holes the ability to shape the ball should give an advantage in the match, should you find yourself off the fairway the rough is kept short, so you should find your ball quickly, but, don’t be surprised if you find yourself stymied behind a tree and have to bring out some of that recovery magic. On those occasions I have had to play Stavanger the condition has always been immaculate. If you fancy a fine test of your shotmaking abilities, Stavanger is the course for you. 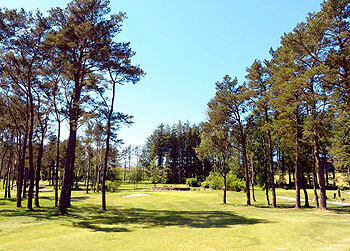 Stavanger Golf Club is set in beautiful parkland surroundings just 10 minutes from city centre. It is a relatively short, but challenging par 71 course. Sheltered from the wind by tall pinetrees which houses lots of squirrels. Early mornings you might also see deer and other wildlife crossing the fairways. Greens are small and fairways narrow, but as the rough is very well maintained you won't lose many balls here. Having hosted numerous Norwegian Championships over its 50 year history it has established itself as one of the finest courses in Norway. Best time to play it is between May - September. Having played 90% of the top 20 list in Norway, I concur with the fact that there are undoubtedly better playing surfaces at Oslo GK and Miklagard during summer. These courses have earned their position 1 & 2 for Norwegian courses. However, the Stavanger GK layout is competing strongly with Oslo GK for the most interesting round that would put a test to your shotmaking abilities. Unless of course, if you are dead straight with all your shots. Neatly shaped holes and very interesting green areas, combined with the neatly shaped holes all around the course makes this a splendid test for all golfers. For the long-hitters, this course does not at all allow you to hit a cracker without thinking well ahead. Too score well, however, some distance and precision is needed. The signature par 3s, hole 3 and 17 are both competing for the best in Norway, and the final heat does actually include only those 2 holes. Bunkers have been placed strategically, mostly around the greens, but some do struggle with sand quality. That is the next step for improvement. As is the Westcoast weather which hinders enough warm nights in summer to have the same impeccable conditions as the best Eastcoast courses. On the other hand, the same climate allows for open greens to the end of November and normally good conditions in early April. Drainage has been significantly improved, and the course plays well after heavy rain, or at least the day after... The location of the course near the lake, the design, stone bridges and not to forget the flowery decoration is the nearest you could have of a Norwegian Augusta.